We've received a short letter where the Chef Laura Ravaioli gives her qualified opinion about our project and our e-book. I viewed the activities produced by the Italian students. I can only express enthusiasm and admiration for the pleasant, interesting and multidisciplinary approach to the subject. The e-book is truly a valuable work that combines perfectly the science and communication skills through various means. An excellent result that denotes passion and diligence. The part of the project that I do not agree is the section devoted to recipes that while expressing the history and culinary tradition typical of every participating country, does not seem to me exactly balanced or in any case in line with the principles of the research guide. By this consideration I do not want to take up credit to the great effort but that is intended as a further incentive for reflection: the cooking is a set of chemical and physical processes that we put in place causing substantial changes on the characteristics and properties of a food, so we should try to make ensure that a Super food does not become simply "something good to eat" but that its wonderful properties remain so at the table. She grew up in her grandmother's restaurant, who with her mother gave her an exceptional gourmet "imprinting", when Laura was 24, worked in one of the most fashionable restaurants of the moment, the Hemingway in Rome, where in short time she got the position of second chef in another famous restaurant, Planet Earth, one of the first clubs in Rome. Over the years, Laura has been able to accumulate valuable experience under the leadership of famous chefs, including Vissani and Gualtiero MARCHESI, till 1993 when she was involved in a consulting tour for restaurants around the world, including the chains the Sheraton and Starwood restaurants. 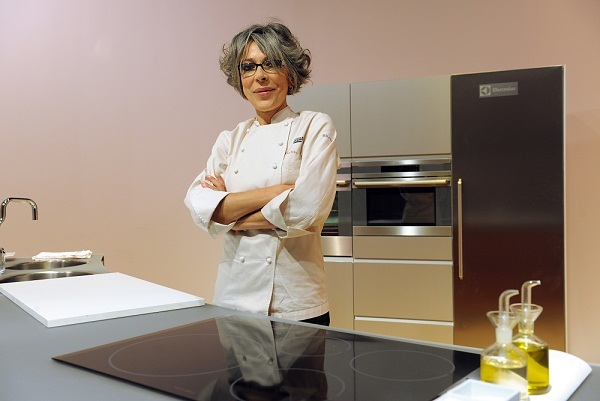 When she hosted the tv programme "The recipes by Laura Ravaioli", on the satellite Gambero Rosso Channel, it quickly jumped to the top of audience satisfaction rankings and there remained firmly for almost the 11 year- duration. Laura Ravaioli activities did not stop only to traditional cuisine, although complemented by insights and curiosity, but she conducted a series of as many as 50 episodes on ethnic cuisine, in a carousel of recipes of all the major places of the world. The culinary philosophy of Laura Ravaioli is very practical, Laura believes in useful research into the kitchen and new experimental techniques, and praises the creations of his colleagues, but basically in the center of his interest is the traditional cuisine, that of the now forgotten dishes. The great gastronomic baggage that has accumulated over the years enables her to pass from the biscuits and cakes, to the dishes of meat or fish and for each of these specialties is able to suggest tasty alternatives, all the while dressed a great human sympathy and helpfulness. Laura Ravaioli has also published several books on food.